Scripture Lady's Preschool Christmas Program: Happy Birthday, Jesus! Scripture Lady’s Preschool Christmas Program: Happy Birthday, Jesus! 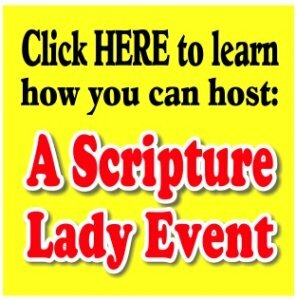 Invite the Scripture Lady to present her preschool Christmas program “Happy Birthday, Jesus!” – a fun Scripture-filled musical presentation for young hearts. Christmas is Jesus’ birthday! Jesus is the reason for the season! This is a truth that our preschoolers can begin to learn and know for their own lives with the Scripture Lady’s newest preschool Christmas program. “Happy Birthday, Jesus!” is full of lively Bible verse songs, Bible skits and games all designed to get your little ones knowing that Christmas is Jesus’ birthday! Christmas Song #1: “Ring, Ring, Ring the Bells” (CEF) – All over the world church bells will ring for birth of our Lord and Savior Jesus Christ! “Ring, Ring, Ring the Bells” is a sweet song from Child Evangelism Fellowship to help start the Scripture Lady’s Christmas program off on the right note! Bible Game #1: “Bells All Over the World” – During this eye-catching Power Point game, the children will be introduced to children of other countries who may or may not look very different from themselves. But each of the children shown will remind them that their are young hearts all over the world who will worship baby Jesus on Christmas too. Christmas Song #2: Some Children See Him by Alfred Burt – This is one of the Scripture Lady’s favorite Christmas songs and is blessed to be able to share it with her Christmas audience. It shares the quaint thought that each child, no matter what country they are from, sees Jesus in their own skin and culture. Bible Game #2: “How Many Candles are on Jesus’ Cake?” – Here is a game that will get your little ones “spinning” for joy as they count how many candles are on Jesus’ birthday cake. Bible Game #3: “I Can Give Gifts to Jesus!” – This game coincides with the previous game. Once a child adds candles to the birthday cake, he will then get to come forward to Scripture Lady’s Christmas tree and find a gift they can give to Jesus. For example, they will learn that they can give Him their eyes that will only look at good things, or their mouths, only to speak words that are kind and loving. Three other gifts are taught and the children will begin to understand that Jesus wants their whole life as a gift. Christmas Song #3: “The Friendly Beasts” – This poem, written by an unknown author of the 12th century, is one Kathy’s favorites. She has taken the lyrics and written her own music to this sweet poem of animals at the manger scene with Jesus. Each animal gives the baby a gift, such as wool from the sheep. Christmas Song #4: “Who is in the Manger?” – This song is the Scripture Lady’s newest Christmas song! It has a black gospel feel to it and teaches the main characters at Jesus’ manger – Jesus, Mary, Joseph, the Shepherds and the Angel. Costumes for the children make this song a big hit! Christmas Song #5: “I Saw Three Ships” – Another one of Kathy’s favorites put to a bit of a salsa beat! Christmas Object Lesson: “The Best Gift of All” – The grand finale is an eye-catching object lesson that uses a bit of “magic” while teaching the preschoolers that Jesus is the best gift of all. Using a trick gift bag, Kathy proceeds to pull out 3 lovely gift boxes from a seemingly empty bag. She shares that Jesus gives us many wonderful gifts, but He is the best gift of all. You have to “see” it to “believe” it!